Oh Dog! DeDe here. Happy Sunday! 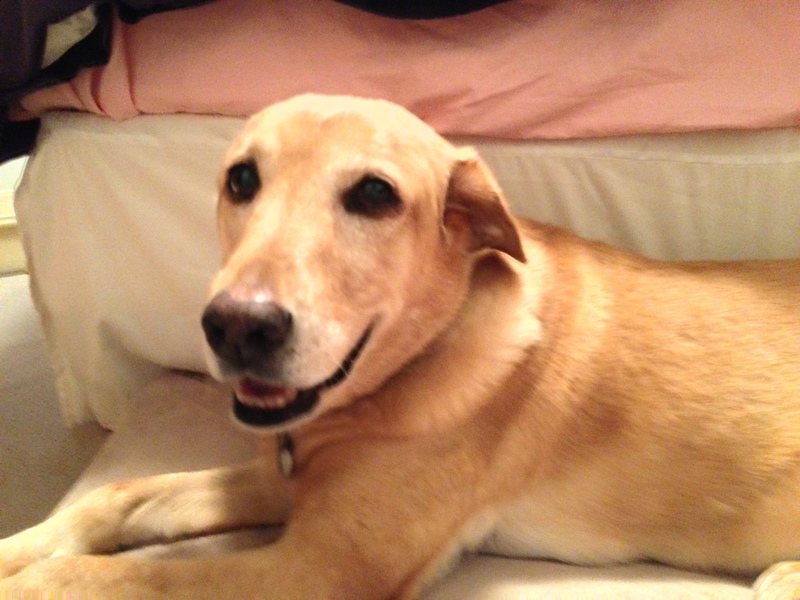 Warm Sunday wishes from DeDe! It had all the making of a 50’s sitcom episode. A frantic call to 911 about a cat stuck in a tree. A school full of children watching from their classrooms. 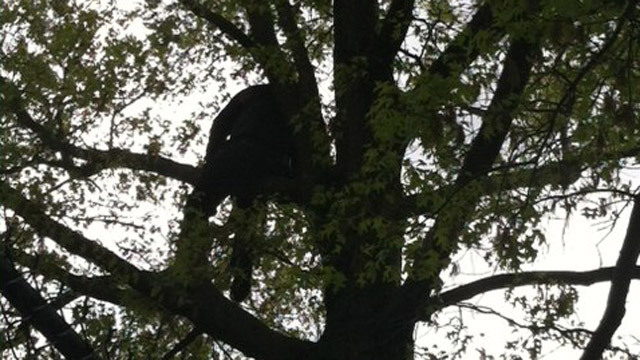 A hero police officer bravely climbing the tree to save the kitty. And that’s just what happened to New York City Police Officer Dane Natto. After his partner quit laughing, he called in the fire department, who also came by to laugh at Officer Natto. But then they used their long ladder to climb the tree and rescue the officer… and the kitty. Cats, don’t try this at home! « Dog Lovers Come in All Shapes, Sizes, and Musical Genres! Your blog is my first one now that I have signed up. I love it !! Bravo for everyone involved! What a silly kitty, that would never happen to you DeDe. You’re too smart (and so very cute)! Awwww…I love stories that turn out well and that’s definitely one!! YAY for the NYPD and Fire Department!! The story is very funny and also heart-warming!!! Officer Natto is in a way brave(!) and so kind to TRY to save the poor kitty! WHEW…. a PAWfect ending!! LOVE IT..
Lol… too funny. I’d imagine once you got up there it would be pretty hard to get yourself down safely with a cat in hand! Yay Officer Natto! Maybe he’ll get lots of fan letters to counteract the teasing. 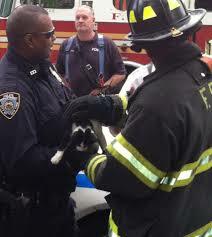 It’s so great to know that firemen everywhere are worried about kitties stuck in trees. Before OurPeople adopted Zhaan, she was taken to the vet clinic by a Good Samaritan because her leg was broken. Before the nice man got her into the building, she jumped from his arms, ran over to an oak tree and climbed 20 ft. up to a branch. Some firemen with a ladder truck came and rescued her, too. OurPeople baked them cookies to say thanks! HAha! That poor guy! Will he ever live it down!!!? A day that police officer will never forget:) We applaud his efforts – he is a good man. Nice guy! One of my little cats got out and ended up high in one of our trees. My hubby climbed up to save her (scaring me to death). Just as he got close to her, she shimmied down the other side just out of his reach. She was gone for three days but finally came home.